I was browsing through David Embry's "Fine Art of Mixing Drinks", looking for some inspiration for a cocktail challenge involving a Fernet Branca slushy, and happened upon the Toronto Cocktail. The Toronto is somewhat similar to a Boulevardier which is a Negroni-esque drink that employs Campari and sweet vermouth but with rye whiskey replacing the Negroni's gin. The Toronto recipe uses Fernet in place of the Campari and completely ignores the vermouth. Since I love both a Boulevardier and a Negroni, I knew a riff on the Toronto was the direction I wanted to take. 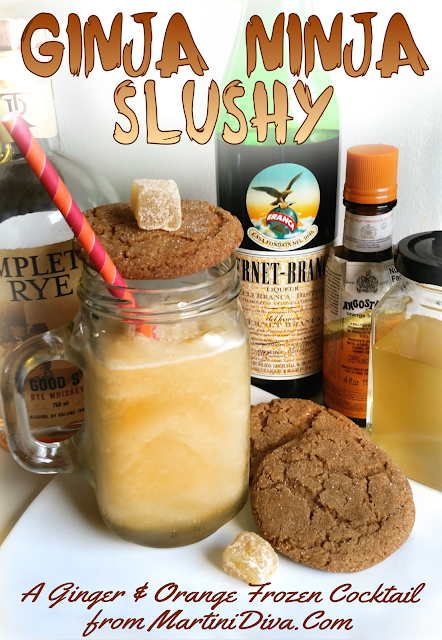 It was then only a matter of how to tweak the classic Embury recipe of "1 part sugar [simple] syrup, 2 parts Fernet Branca, 6 parts Canadian Whiskey and 1 dash of Angostura" for a unique frozen adaptation. Slushy classic cocktails (who are we kidding here, a slushy is just another name for a frozen cocktail) are all the rage lately, especially slushy classic cocktails, like Negroni Slushies. 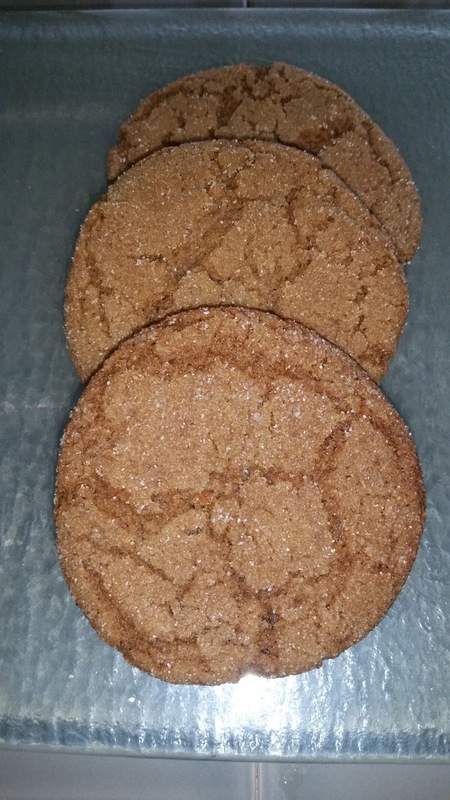 While searching the ratios for doing a Negroni frozen I stumbled on a recipe for Fernet Branca Cookies that were nearly dead ringers for my Mom's Gingersnaps, my favorite cookies ever in the world! The Fernet Branca Cookies and my Mom's recipe for Gingersnaps were practically identical except the Fernet Branca Cookies used oil in place of the butter used in my recipe and, of course, they added some Fernet Branca. 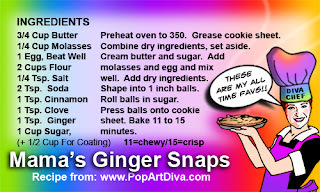 Since I occasionally add a little orange zest to my Gingersnaps when I make them, that was my inspiration. 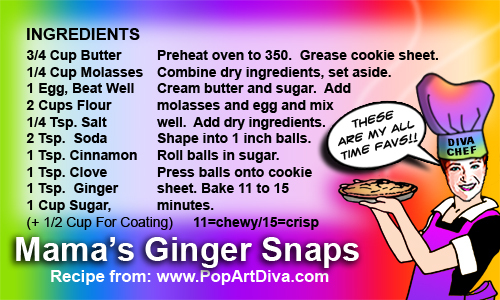 I was going all ninja with ginger and orange flavors for my frozen twist on the Toronto, and I was making those Fernet infused cookies as a garnish! I adapted my recipe because, well, butter instead of oil, and I love the spice balance. Then I added in a teaspoon of orange zest and simply replaced a tablespoon of Fernet for a tablespoon of the molasses in my recipe and added a small pinch more flour. I ate nearly the entire first batch in a day. It was difficult to save a few aside for the cocktail shoot. Then I dunked the 3 left in the cocktail. DIRECTIONS If you have a snow cone maker, prepare your crushed ice according to the machine's directions then pack the ice into your chilled glass until it mounds over the top. Shake the rye, Fernet, orange juice, ginger simple syrup and bitters in an ice filed cocktail shaker then pour over the mounded ice. If you're using a blender, combine the rye, Fernet, orange juice, ginger simple syrup and the bitters in a baggie and place in the freezer for a minimum of 8 hours or overnight, if possible. Add the chilled cocktail mixture and the crushed ice to a blender and blend to a slushy consistency then pour into your chilled glass. Garnish and serve, with the Fernet Branca infused cookies, of course. You might want this sweeter, considering it's a slushy. Start with a tablespoon of the simple syrup when you mix the cocktail. Once you add ice the sweetness will dissipate quite a bit so take that into consideration. I ended up adding another tablespoon of syrup during the final blend, but I have a major sweet tooth. DIRECTIONS Bring the sugar, ginger, and juice to a boil in a small saucepan. Stir until the sugar has dissolved then remove from the heat and cool. Strain into a jar, cover, and chill. The syrup can be kept up to 2 weeks if refrigerated.